We thank all of you for your interest in Digital Scrapbooking and in CreativeSnaps's way of enjoying it!! As you all ask questions, and as we find answers... we'll always update this FAQ page. Digital Scrapbooking is so much fun and EASY once you get the hang of it!!! Please send us your questions through our contact us, and read through our FAQ! Q: What is digital scrapbooking? A: It is scrapbooking on your computer using all digital elements (digital papers, digital embellishments, etc.) and photo/graphics editing software. It is fun and easy and SO CONVENIENT!!! No mess, no stress! Everything is tucked away so neatly on your hard-drive! Q: I just bought one of your kits and I'm new to digital scrapbooking, I'm not quite sure what to do with it? A: Well, congratulations! You have made a great first step towards learning to digital scrap! Next? TUTORIALS, TUTORIALS, TUTORIALS, LOL! 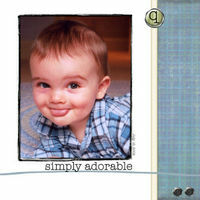 Go to the BEST digital scrapbooking resource on the web, scrapbook-bytes.com. This is a site that has tons of GREAT tutorials for beginners and has a section in their forums that is dedicated to people just like you... newbies! I do plan on adding tutorials here in the future as well. Q: Do you have a favorite photo-editing software package? A: Yes, Photoshop 7! I have been using Photoshop for 10 years and feel extremely comfortable with it! At first it was a little tricky, but I figured everything out! My personal recommendation for a beginner would be Photoshop Elements. A: MAC. I would highly recommend a Macintosh over a PC... I feel very strongly about this! My husband is a total tech geek, at one time he was over all of the computers/networks/internet for a Fortune 20 company, and I managed to convert HIM to be a Macintosh user... plying him away from his UNIX machines! Now he won't use anything else.. LOL. Actually, he is STILL using my OLD MAC that I had when we met!!! Yes, they last so long and are so easy to upgrade! You will not be sorry if you get a MAC. Q: I am a paper scrapper, do you offer a paper line of products? A: Guess what? You can PRINT all of our digital elements and papers and use them that way! And, I actually do have a real paper line available through the manufacturer A2Z Essentials! They sell to scrapbooking stores nationwide and also sell to several online paper stores like lifetimemoments.com! Q: What do people do with digital scrapbook pages? A: Well, the possibilities are endless. 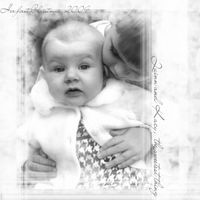 Personally, I like to get mine printed out as 12x12 or 8x8 photographs and put them into a scrapbook album. I am always emailing my layouts to friends and family who don't live near us to let them know what our family is up to. You can also make a DVD or computer slideshow with them and add music/sound. You can get them printed, and then framed. You can make duplicate albums and give them to grandparents and mother-In-laws as gifts. You can print them as 2x2, laminate them and make a keychain flipbook. You can also print them out and decoupage them to furniture and on walls. I want to do this in my family room. Like I said, the possibilities are endless. Q: I just purchased and downloaded a kit and I can't seem to get it to work....What should I do? A: DON'T PANIC! Just use the Contact Us on this site and I'll get right on it. 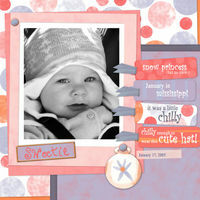 Digital Scrapbooking is getting popular all over the world, and we are having our kits (especially the freeBEE's!) downloaded thousands of times each month. Q: How long have you been digi scrapping? A: Yes. its in the form of a Yahoo Group! I do always tell my group members about my site freeBEE. You can join my Yahoo Group, CreativeSnaps, by clicking the Yahoo image at the bottom of this website. Q: I made a purchase but I can't get back to my download page, what should I do? A: Our site currently redirects you immediatly after purchase to a downloads page with all of your download links on it. You will not be able to re-access your links after you leave that page, but if something happens and you did not get to download all of your kits, just drop me an email and I will GLADLY email you your links....we are currently working to make an easier way for you to re-access links but don't have it in production yet.